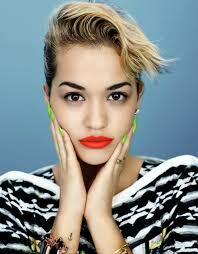 Ever since Rita stepped on the scene she has taken the fashion and music industry by storm. Her edgy style and signature red lips have captivated fashion addicts around the world. Growing up in trendy west London, Rita has stated that her fathers interest in reggae influenced her taste I music and I think it possibly could have influenced her taste I fashion. Known for he off-beat style infused with London coolness, Rita is usually spotted combining high street fashion and high end fashion. Almost everything she wears is either quirky, tartan, bright coloured or unconventionally cut. With her peroxide beach blonde hair and her nonconformist attitude to fashion, Miss Ora is bringing the edge back into pop music.